Hey guys we find a grate offer for you. FreeCharge Exclusive: Rs. 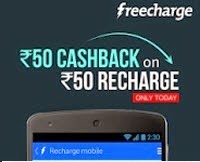 50 Cashback on Recharge of Rs.50 or more. In this offer is exclusive for you by FreeCharge. FreeCharge is also good knowing website like paytm. earlier we post about Paytm promo code now this article about FreeCharge website. Which this article help you will get Rs.50 cashback on Rs.50 or more recharge. so don’t west time and read article and grab this offer. After Successful Sign up or login, Process to prepaid mobile recharge. Enter mobile no.,Now Select prepaid and Operator. Now select top up/special recharge. Make payment via Debit / Credit card. Enjoy Rs.50 cashback,which will be added in your wallet within 24 Hours after recharge. Valid on Min Recharge of Rs.50 or more. Valid on successful Recharges/Bill Payments. Promocode must be applied to avail this cashback offer. This cashback is non transferable. Not Valid for Add Cash Transactions and transactions done via FreeCharge Balance & Netbanking. Not Valid for Airtel users.